the amount of energy liberated or expended in a given unit of time. Energy is stored in the body in energy-rich phosphate compounds (adenosine triphosphate, adenosine monophosphate, and adenosine diphosphate) and in proteins, fats, and complex carbohydrates. See also basal metabolic rate. the rate at which an organism carries out METABOLISM, and which is closely linked to temperature. The relationship between metabolic rate and temperature can be expressed in terms of a value called Q10. See also BASAL METABOLIC RATE. acidemia due to metabolic error. includes a range of bone diseases associated with metabolic diseases, e.g. secondary hyperparathyroidism, rickets and osteoporosis. generally an inherited defect that is present at birth, but which is not necessarily evident clinically for several months afterwards. The defect creates a metabolic error, which leads to the accumulation of end products which cause clinical signs, e.g. mannosidosis, porphyria or an exaggerated response from an end-organ, e.g. inherited goiter. See also inborn error of metabolism. diseases in which normal metabolic processes are disturbed and a resulting absence or shortfall of a normal metabolite causes disease, e.g. hypocalcemia in cows, or an accumulation of the end products of metabolism causes a clinical illness, e.g. acetonemia of dairy cows. Many diseases in this group really have their beginnings in a nutritional deficiency state. See also production diseases. many disorders of metabolism can lead to neurologic abnormalities through alterations in electrolytes and acid-base balance, accumulation of endogenous toxins. See also encephalopathy. a virus neutralization test in tissue culture in which phenol-red indicator is used to detect the acid metabolic products of actively metabolizing cells or the lack of metabolism when cells are infected and destroyed by the virus. muscular dystrophies caused by metabolic defects; include systemic glycogenoses, deposits of a PAS-positive glycoprotein, the lipid storage disease of cats caused by carnitine deficiency. groupings of enzymic processes leading to the synthesis or breakdown of carbohydrates, amino acids and lipids. a muscle disease associated with a metabolic disorder, e.g. hyperadrenocorticism. a disease of the nerves associated with a metabolic disorder, e.g. uremia, diabetes mellitus or hypothyroidism. results of a spectrum of tests of metabolic functions. see compton metabolic profile test. the rate of energy metabolism in the body. The basal metabolic rate (BMR) is the rate of energy consumption by the body when it is completely at rest. characterized by hypertension, insulin resistance, an abnormal plasma lipid profile, and obesity. include histamine, other toxic amines, ketone bodies, phenols and cresols from the large intestine, which are normal end-products of metabolism and indigestion but if their normal excretion and detoxication are impeded, cause intoxication. See also toxin. the water produced in the body by oxidative metabolism of food; it represents 5-10% of the body's water utilization. the frequency with which an event or circumstance occurs per unit of time. the proportion of a population affected by a specific condition during a prescribed, usually short, period of time. the rate of occurrence of a specific attribute. an expression of the rate at which oxygen is utilized in a fasting subject at complete rest as a percentage of a value established as normal for such a subject. the number of births during one year for the total population (crude birth rate), for the female population (refined birth rate), or for the female population of reproductive age (true birth rate). the number of deaths due to a specific disease as compared with the total number of cases of the disease. the rate of occurrence of e.g. disease in cohorts. the number of deaths per stated number of animals (1000 or 10,000 or 100,000) in a certain region in a certain time period. 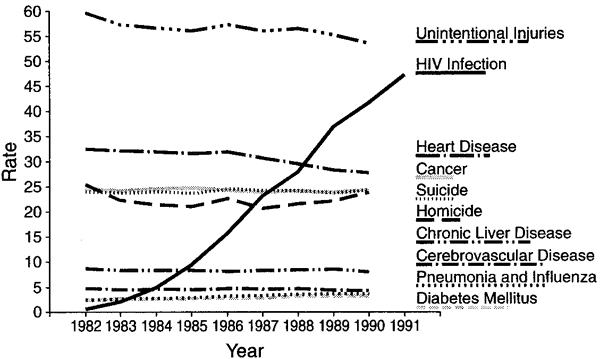 the number of deaths caused by a specific circumstance or disease, expressed as the absolute or relative number among individuals encountering the circumstance or having the disease. an expression of the number of survivors with no trace of disease 5 years after each has been diagnosed or treated for the same disease. see maximal expiratory flow rate (below). an expression of the quantity of glomerular filtrate formed each minute in the nephrons of both kidneys, calculated by measuring the clearance of specific substances, e.g. inulin or creatinine. an expression of the increase in size of an organic object per unit of time. the number of contractions of the cardiac ventricles per unit of time. describes the probability of a new case occurring during a stated time interval. percentage of the population from which a specific infectious pathogen is isolated. rate controlling enzymic steps in metabolic pathways. Often allosteric enzymes with allosteric effector sites but can be controlled through substrate availability, product removal or enzyme concentration. the slope of the line connecting the points 200 ml and 1200 ml on the forced expiratory volume curve. See also pulmonary function tests. Called also FEF200-1200. an expression of the amount of oxygen consumed by the body cells. the number of cases of a given disease occurring in a specified period per unit of population. death rate; the mortality rate of a disease is the ratio of the number of deaths from a given disease to the total number of cases of that disease. percentage of reactors in a tested population. the number of movements of the chest wall per unit of time, indicative of inspiration and expiration. the rate at which a sediment is deposited in a given volume of solution, especially when subjected to the action of a centrifuge. See also sedimentation rate. expresses the frequency of a characteristic per unit of the population. adaptation of a rate so that the conditions under which it occurred are comparable with those in which other rates have been estimated. There are several methods, e.g. the equivalent average death rate. Part of the reason for the discrepancy is the lack of the metabolic rate component in the DR formula. After metabolic rate was measured during byssus attachment and SDA, mussels were removed from the chambers but maintained in their cups and placed in an aquarium that received the same flow-through seawater as used in the respirometers. The challenge was to find a natural way to maintain body weight and resting metabolic rate without the cardiovascular or central nervous system side effects seen with stimulant-associated fat-burning agents. Metabolic rates of ectotherms typically increase with increasing temperature (Bennett and Dawson, 1976). Published reports of metabolic rate of adults of various species of Orthoptera were used to establish the relationship between size and metabolic rate (Table 1). Measuring a patient's body weight and an evaluation of body fat levels through the use of upper arm skin fold measurements can be useful to assess the effects of a patient's nutrition but calorimetry provides a direct measurement of the patient's overall metabolic rate and the specifics of carbohydrate, fat, and protein oxidation. Standard metabolic rate data for each individual were plotted against time and averaged over all hours (range 1-7 hours) after the outflowing P[O. The low metabolic rate of spiders and other arachnids has been suggested as an adaptation to living in environments with unpredictable food supplies (Anderson 1970; Greenstone & Bennett 1980; Anderson & Prestwich 1982; Lighton & Fielden 1995). It can differ by as much as 25% from person to person, and unfortunately for us ladies, our metabolic rates tend to be lower. After years of research, it is now clear that people who are overweight actually have a higher metabolic rate than lighter people. To gain lean muscle without gaining excess body fat is possible, but you have to be very disciplined - and you have to make sure that you eat the correct portions of protein and carbohydrates for your specific metabolic rate so that you will be successful. In addition to displaying weight, body fat, and water percentages, the InnerScan monitors daily caloric intake by estimating the number of calories that can be consumed in the next 24 hours to maintain your weight based on basal metabolic rate; metabolic age rating by comparing your basal metabolic rate to the average age associated with that level of metabolism; visceral fat, located in the abdominal cavity, surrounding the vital organs; muscle mass; bone mass; and physique rating, which is the level of fitness based on the ratio of fat and muscle mass in the body.